For other people named James Rice, see James Rice (disambiguation). Rice was an eight-time American League (AL) All-Star and was named the AL's Most Valuable Player in 1978 after becoming the first major league player in 19 years to hit for 400 total bases. He went on to become the ninth player to lead the major leagues in total bases in consecutive seasons. He joined Ty Cobb as one of two players to lead the AL in total bases three years in a row. He batted .300 seven times, collected 100 runs batted in (RBI) eight times and 200 hits four times, and had eleven seasons with 20 home runs. He also led the league in home runs three times, RBIs and slugging percentage twice each. Rice's three-run home run was the key blow in helping the Pawtucket Red Sox (International League) defeat the Tulsa Oilers (American Association) in a 5–2 win in the 1973 Junior World Series. After he was AAA's International League Rookie of the Year, Most Valuable Player and Triple Crown winner in 1974, he and fellow rookie teammate Fred Lynn were brought up to the Red Sox at the same time, and were known as the "Gold Dust Twins". 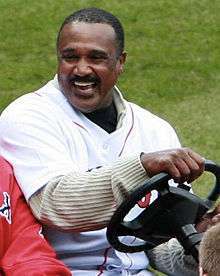 He was promoted in the Red Sox organization to be a full-time player in 1975, and finished in second place for the American League's Rookie of the Year honors, and third in the Most Valuable Player voting, after he finished the season with 174 base hits, 102 runs batted in, a .309 batting average and 22 home runs; Lynn won both awards. The Red Sox won the AL's East Division, but Rice did not play in either the League Championship Series or World Series because of a wrist injury sustained during the last week of the regular season when he was hit by a pitch. The Red Sox went on to lose the World Series, 4 games to 3, to the Cincinnati Reds of the National League (NL). In 1978, Rice won the Most Valuable Player award in a campaign where he hit .315 (third in the league) and led the league in home runs (46), RBI (139), hits (213), triples (15), total bases (406, a Red Sox record) and slugging percentage (.600). He is one of only two AL players ever to lead his league in both triples and home runs in the same season, and he remains the only player ever to lead the major leagues in triples, home runs and RBIs in the same season. His 406 total bases that year were the most in the AL since Joe DiMaggio had 418 in 1937, and it made Rice the first major leaguer with 400 or more total bases since Hank Aaron's 400 in 1959. This feat wasn't repeated again until 1997, when Larry Walker had 409 in the NL. No AL player has done it since Rice in 1978, and his total remains the third highest by an AL right-handed hitter, behind DiMaggio and Jimmie Foxx (438 in 1932). Rice is the only player in major league history to record over 200 hits while hitting 39 or more HRs for three consecutive years. He is tied for the AL record of leading the league in total bases for three straight seasons, and was one of three AL players to have three straight seasons of hitting at least 39 home runs while batting .315 or higher. From 1975 to 1986, Rice led the AL in total games played, at bats, runs scored, hits, homers, RBIs, slugging percentage, total bases, extra base hits, go-ahead RBIs, multi-hit games, and outfield assists. Among all major league players during that time, Rice was the leader in five of these categories (Mike Schmidt is next, having led in four). In 1984 he set a major league single-season record by hitting into 36 double plays. His 315 career times grounding into a double play ranked third in major league history behind Hank Aaron and Carl Yastrzemski when he retired; he broke Brooks Robinson's AL record for a right-handed hitter (297) in 1988, and Cal Ripken, Jr. eventually surpassed his mark in 1999. Rice led the league in this category in four consecutive seasons (1982–1985), matching Hall of Famer Ernie Lombardi for the major league record. The on-base prowess of Rice's teammates placed him in a double play situation over 2,000 times during his career, almost once for every game he played. Rice posted a batting average of .310 and slugging percentage of .515 in those situations, better than his overall career marks in those categories. Rice's most notable humanitarian accomplishment occurred during a nationally televised game on August 7, 1982, when he rushed into the stands to help a young boy who had been struck in the head by a line drive off the bat of Dave Stapleton. As other players and spectators watched, Rice left the dugout and entered the stands to help 4-year old Jonathan Keane, who was bleeding heavily. Rice carried the boy onto the field, through the Red Sox dugout and into the clubhouse, where the young boy could be treated by the team's medical staff. Rice's delay in being elected to the Hall of Fame stemmed in part from more current statistical analysis of player performance. This analysis suggested that Rice's HOF credentials might have been more questionable than they were considered during his career. The delay may also have been related to his often difficult relationship with the media during his playing career, many of whom are still voting members of the BBWAA, and his career fading relatively early – he last played in the major leagues at the age of 36. Some writers, such as the Boston Herald's Sean McAdam, said that Rice's chances improved with the exposure of the "Steroids Era" in baseball. In the same article, McAdam expanded this subject by adding: "In an era when power numbers are properly viewed with a healthy dose of suspicion, Rice's production over the course of his 16 years gains additional stature." As such, he has received increasingly more votes each year since the 2003 ballot, improving his vote totals by 133 votes over the last five years on the ballot. However, from several sabermetric standpoints (not including Black Ink, Gray Ink or HOF Monitor) it can be argued that Rice falls short of his peers in the Hall of Fame. Nevertheless, several commentators have noted that the continued criticism of Rice's statistics not meeting sabermetric standards is unfair given that several other Hall of Fame players, notably Andre Dawson and Tony Pérez, fare even worse against such standards. Although other players have compiled career statistics more similar to Rice's, most notably 1999 Hall inductee Orlando Cepeda, perhaps the most similar player to Rice was 1968 inductee Joe Medwick. Both were power-hitting left fielders who batted right-handed and played their home games in stadiums which favored hitters, and both had a period of a few years in which they enjoyed a remarkable burst of offense, each winning an MVP award at age 25 – Rice after collecting 400 total bases, and Medwick after becoming the last NL player to win the Triple Crown. Both retired at age 36 due to the cumulative effect of various minor injuries. Their career totals in games, at bats, runs, hits, RBI, steals, on-base percentage, slugging percentage, extra base hits and total bases are all fairly similar, with notable differences only in batting average and home runs; Medwick's higher average (.324 to .298) can be partially attributed to the higher emphasis on batting average in the 1930s, while Rice's advantage in home runs (382 to 205) is largely the result of a dramatic increase in homers over the 40 years between their careers (Rice ranked 10th in AL history upon his retirement, while Medwick ranked 11th in NL history upon his). Medwick was elected to the Hall in his final season of eligibility in 1968, which Rice also duplicated. ↑ NESN; article: "Lynn Thrilled for Rice, His 'Gold Dust Twin' Hall of Famer"
↑ Benjamin, Amalie (November 29, 2008). "Red Sox select Bogar to replace Alicea on staff". The Boston Globe. ↑ Shaughnessy, Dan (January 11, 2006). "Verdict is in: Rice still a tough out". The Boston Globe. Goldberg, Jeff (1997-08-07). "The Day Rice Made Contact". The Hartford Courant. Retrieved 2007-02-28. Antonen, Mel (2007-01-09). "Baseball Hall of Fame Chat: Mel Antonen". USA Today. Retrieved 2007-03-01.